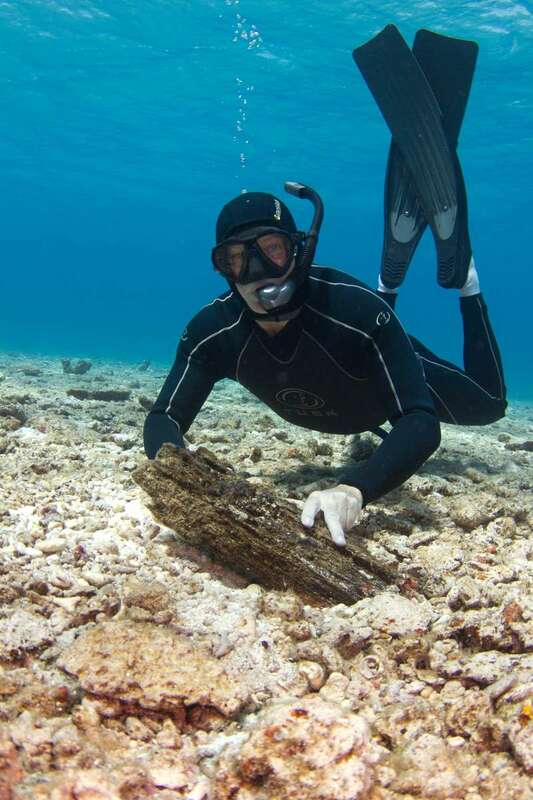 Museum diver Lee Graham with a section of timber framing from the Royal Charlotte shipwreck. Over the last four years, the Australian National Maritime Museum’s underwater archaeology program has been uncovering evidence of Australia’s strong colonial trade links to Asia. In January (2012), the museum’s archaeology team located the remains of the Royal Charlotte, wrecked in 1825. The Indian-built three-masted ship had just brought convicts to Sydney, and was en route to India with a contingent of British troops and their families when it ran aground during a gale on the inaccurately charted Frederick Reef, approximately 450 km off the Queensland coast. The Royal Charlotte was the second wreck site discovered by the museum’s archaeology team in the Coral Sea and the Great Barrier Reef in recent years that demonstrates the strong trade links between Australia and India during the early years of the colony. Previous expeditions to the Coral Sea and Great Barrier Reef by the museum discovered the wrecksite of the Indian built schooner HMCS Mermaid (in 2009) made famous by its circumnavigation of Australia in the early 1820 whilst under the command of Phillip Parker King and another expedition in 2010 re-surveyed the wrecksites of HMS Porpoise and the merchant ship Cato which had been lost on Wreck Reefs whilst on a passage to India in 1803. In late October this year the Museum announced plans for a further expedition in early 2013 to continue this research. The Indian built, three masted, armed, copper sheathed, teak, 555 ton ship Fergus(s)on was bound from Sydney (NSW) to Madras (India) in convoy with the Orient and Marquis of Hastings when it was wrecked on a reef in the vicinity of the Sir Charles Hardy Islands on April 27 1841 in the latitude of 12° 18’S and 143° 54E. The passengers (170 rank and file of the 50th Regiment of Foot) and crew were subsequently rescued by the crews of the accompanying vessels and the Fergus(s)on remained on the reef for a number of years acting as an informal beacon for those navigating this particularly hazardous section of the reef. Because of its informal use as a navigation mark the reef overtime became known as Ferguson Reef and lies on the outer edge of the Great Barrier Reef approximately 60 nautical miles offshore from Fair Cape and 50 miles south of the Raine Island Entrance in Far North Queensland. Wreckage consisting of chain and ballast stones believed to be off the Fergus(s)on were sighted in the middle of Ferguson Reef in 1986 and several expeditions by the Queensland Museum have attempted to survey the remains of this and other historic shipwrecks in the area. The Royal Charlotte and proposed 2013 expeditions are part of an Australian Research Council project, a joint project between the Australian National Maritime Museum, the Silentworld Foundation and Sydney University. * The Silentworld Foundation is a not-for-profit Foundation established to further Australian maritime archaeology and research, and to improve Australia’s knowledge of its early maritime history.